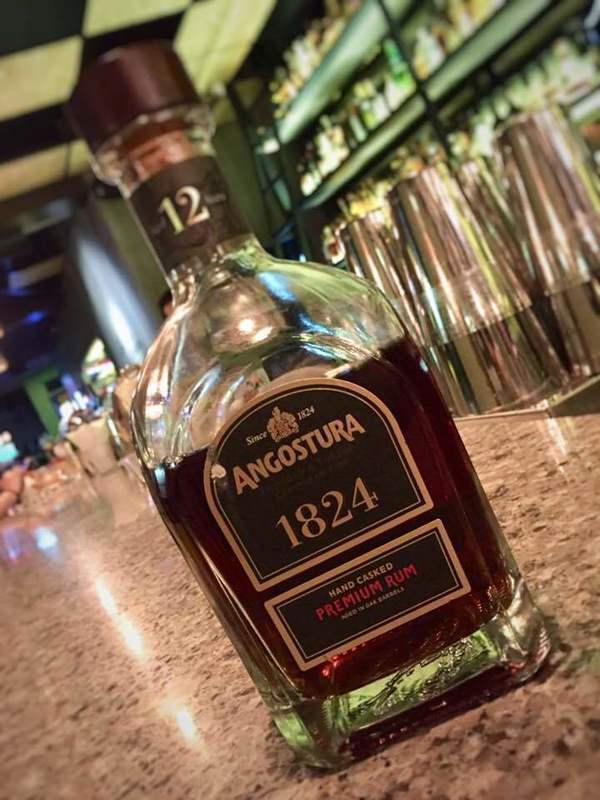 Have you found an online vendor selling Angostura 1824? Angostura 1824 rum is a blend of rums aged for at least 12 years in oak barrels. The aged rums are blended, re-casked, and upon maturity hand-drawn for bottling. This rum is named and crafted in honor of Dr. Johann Siegart's founding of Angostura house in the city of Angostura, Venezueala in 1824. 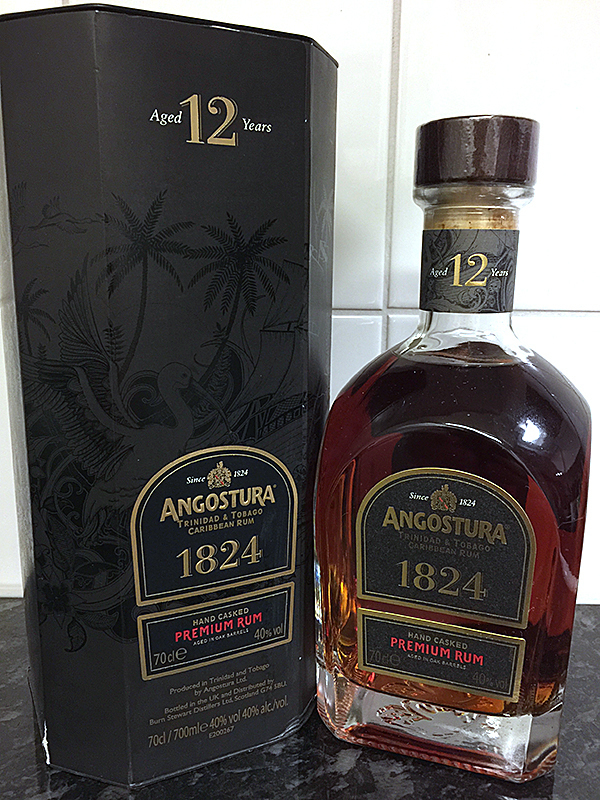 Angostura 1824 rum production is now based in Trinidad. Edit 28-09-17: I am deducting a point since my new bottle seems distinctly sweeter and definitely betrays added sugar. Either they increased the sugar or I missed it the first time. This is about as far from a partydrink rum can get. It is truly aged, smokey, leatherly, oakey and smells of an old library. To be enjoyed quietly, late at night. You'll like this if you like cigars, aged scotch and pseudo-intellectual drunk talking. This rums comes in a nice package with a good looking bottle and a nice black canister (picture). It even comes with a small booklet. A quality package in my opinion. You have to let this rum rest in the glass for a while. At first you get som sticky alcohol and not much aromas but after a while you can sense fruit, vanilla, spice and oak. A lot off different aromas in the glass. When you taste this rum you get a spice, smoke, oak and some sweetness. Not as sweet as I would like it to be but it is still quite smooth. The Angostura 1824 has a long aftertaste with a lot of spice and oak. A bit too harsh for my taste. This is a sipper but for me I want my rum to be sweeter so I will probaly use this rum as a mixer. Not very happy with my purchase. Like jazz, so much going on with the flavors in this rum. Molasses, oak, citrus, honey, smoke, leather all come to the pallette. A wonderful and complex nose. As someone else said an intellectual's rum but maybe that's because I'm half drunk listening to Sigor Rós. Lastly never ever mix this. Enjoy! Nice smooth and tasty rum. This rum with good cigar are fine pair to spend nice evening. Love this rum but the only negative is that it is a bit too sweet. Excellent flavor profile, with hints of tobacco, leather, vanilla. Delicious rum but more for dessert. Color is a nice Dark Amber. Legs are thin but seem to cling longer than you would expect. The nose is of sweet molasses, vanilla, and butterscotch. The taste is drier than the nose but still has predominate flavors of molasses and vanilla. The oak of the barrel is definitely present. A second sip brings out a bit of leather and tobacco. The finish is a bit hot with lots of spicy notes. Leaves me wanting more. A very complex rum. A keeper for sure. — at The Rum Bar KL. This is a little lighter rum of the super premiums not as complex or heavy as some are but definitley the smoothest I have ever tasted of anything 18 years or less. Angostura has certainly got my vote for a superb Rum maker. A must have for my cabinet. Lovely amber colour , nose of vanilla , spices and raisins. Smokey but quite dry tasting with a nice bite. I like this on its own , or with ice and its as an excellent mixer . A good all round rum in fact. This rum has great flavor at the same time as being very smooth. It is a slightly sweet rum (my favorite rums are) but still has the oak tone to it - just not overpowering like some. Overall it is VERY near the top of my list. Nice flavored rum, but loaded with added sugar. Too bad. Vanilla and caramel come through, as well as some smokiness. A shame it's been sweetened so heavily. Sugar: 16 gpl. A smooth rum with a heavy taste of Oak and tobacco with a hint of dark chocolate and vanilla. It's not a sweet rum and at $80 per bottle I don't see the value in this over some other rums in that price range The 1824 is a good tasting rum and it's worth having in your collection for it's different taste. Good flavor, but the bite dominates. $'s don't equate. edit-a fresh tasting/ that 6 may be too high. Something is overpowering here. ...while it might be better, the price difference in the UK at least, just doesn't make sense. OK the 1919 is much more commercial and a crowd pleaser but it is about half the price. It is rich and complex, but the price just makes my view of it a little jaundiced. Angostura 1824 je namíchána z rumů, které zrály v sudech po bourbonu po dobu nejméně 12 let, byly ručně smíchány master blenderem a znovu uloženy do sudů. Letopočet 1824 připomíná rok, kdy byl v Angostuře poprvé vyroben rum. Hrdlo je masivně zapečetěno voskem, s otištěnou pečetí. (edit: týká se ještě starší verze lahve). Ve skutečnosti působí lahev ještě lépe, než na fotografiích, počínaje reliéfem lodi na krabici, přes pečetní vosk, korek usazaný v krásné dřevěné zátce s erbem, až po číslování jednotlivých lahví. Pro srovnání jsem testoval s Ron Barceló Imperial, který mám hodně rád. Aroma: Ve vůni vosk, včelí plástve, propolis,staré dřevo, působí velmi vyzrále, a nad vším je nezaměnitelný hřebíček s medicinálními tóny. Učiněná pastva pro moje čichové buňky. Chuť: První dojem nádherné jemnosti vzápětí vystřídá pikantní plná chuť, kouřovitost, angosturská medicína, vyzrálost.Dochuť je extrémně dlouhá, a stejně jako ve vůni i chuti je v duchu hřebíčku a medicíny, pro kterou asi bude buď zatracována, nebo milována.Já patřím určitě do druhé skupiny. Angostura mi vyloženě sedí, tahle její vlastnost ji odlišuje od ostatní rumové produkce a je díky tomu nezaměnitelná a originální. this one is nice to sip and anjoy on its one withe a good sigar! One if the smoother rums I've had. Just the right amount of slight spice with a shorter finish than expected. Strong brown sugar nose. Woodsy notes with a touch of molasses. Lacks some character and depth, or would have gone to 8 or 9. Spiced room. Strong. Nice and sweet aroma of orange and citrus. aftertaste of oak and tobbako. light mouth. A very smooth drink but definitely not worth the standard price point. Other options are better.